Like the rest of the shoreline on this side of Maui, the Kama’ole area is occasionally from the south often generate high winds, huge waves, and heavy rains, all of which cause considerable damage to shoreline property. They also severely erode any beach unprotected by a coral reef. When the sand disappears from the beach at Kama’ole II, a large bed of shingle is exposed, and as the waves surge and recede across these rounded beach rocks or ‘ili’ili, an ominous rumbling results. The Hawaiian called this beach ‘Ili”iliholo, “running pebbles,” for this unpredictable and dramatic phenomenon. The beach at Kama’ole II is a very white sand beach located between two rocky points. The sandy offshore bottom drops off sharply to overhead depths. Usually a small shorebreak is present, attracting bodysurfers. Swimming is safe except during periods of heavy surf or kona storm. Facilities in the grassy park include restrooms, showers, picnic tables, barbecue grills, and paved parking. 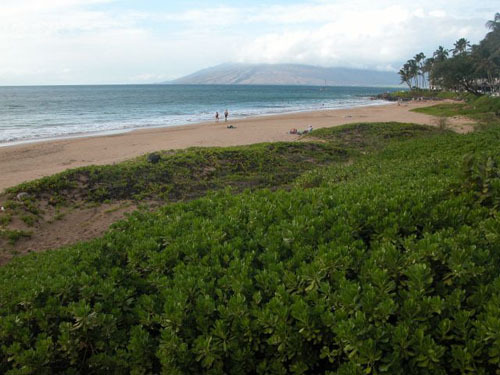 Kama’ole II Beach Park is located in the 2500-area of South Kihei Road.